At the end of her bestselling Coldfire Trilogy, C.S. Friedman challenged readers to imagine what a world would be like if sorcery required the ultimate sacrifice–that of life itself. 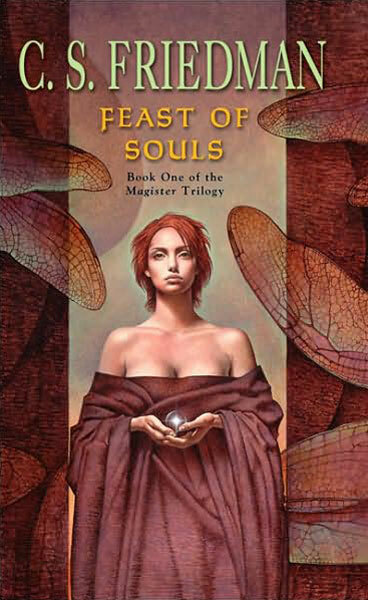 Now, in a groundbreaking new fantasy novel, FEAST OF SOULS, she introduces us to a terrifying new world in which the cost of magic is just that–a world in which the fuel for sorcery is the very fire of the human spirit, and those who hunger for magical power must pay for it with their lives. In this epic tale of terrifying shadows and desperate hope, the greatest threat of all may not be that of ancient enemies returned, or ancient wars resumed, but of the darkness that lies within the hearts of men. Please note: Cover art copyright is held by John Palencar, who has graciously given his permission to post it here, and only here. Please do not copy, post or disseminate this pic in any way; that includes printed copies, wallpaper, links, and (for you mutant data pirates) telepathic communion. Imnea knew when she awoke that Death was waiting for her. She had been seeing the signs of his presence for some time now. A chill breeze in the corners of the house that wouldn’t go away. Shadows that seeped in through the windows, that didn’t move with the light. The icy touch of a Presence upon her skin when she healed the Hardings’ little girl, that left her shuddering for hours afterwards. The mirror revealed little. Of course. It wasn’t the way of witching folk to age and die like normal people. The fuel within them was consumed too quickly, like a stove in which all the winter’s wood had been placed at once. What a blaze it made! Yet quickly gone, all of it, until it smothered in its own ash. How long ago had the dying begun? Did it start in her youth, when she first discovered she could do odd things…tiny little miracles, hardly worth noting…or not until later? Did Death first notice her when she made tiny points of fire dance on the windowsill, with a child’s unconscious delight (and how her mother had punished her for that! ), or not until she reached deep within herself with conscious intent to draw strength from her very soul — from that central font of spiritual power which mystics called the athra — and to bend it to her purpose? When and where was the contract with Death sealed, and what act marked its closing? The healing of Atkin’s boy? The calling of rain after the Great Drought of ’92? The day she had cleansed Dirum’s leg of its gangrene, so that they wouldn’t have to cut it off? She was thirty-five. She looked forty-five. Soon, Death whispered, his voice disguised as the whisper of falling snow. Soon…. With a sigh she fed some more wood into the stove and tried to stoke its dying embers to more radiant heat. It had been more than a year now since she’d last used the power. She’d hoped that if she stopped, some of her strength would return. Surely whatever internal energies created the athra in the first place could restore it to strength, if you stopped drawing on it to do things. But even if that were true, how much of her life was gone already? Each time she had used the magic to heal a child, cast out a demon, or bless a field against the onslaught of locusts, she had drawn upon her own life-force for power. The supply wasn’t endless. All the witching folk knew that. Just as the flesh became exhausted in time, so did the fires of the spirit bank low, smolder, and finally extinguish. Use the fuel for things other than staying alive and the fire would be extinguished that much sooner. Yet…how could you have the power to heal, and not use it? How could you watch a child turn blue before you and not clear out its lungs and give it life again, even if the cost was a few precious minutes of your own life? Minutes had seemed like nothing in the beginning. What do young people know of time, especially when the Power is pounding in their veins, demanding expression? By the time you became aware that minutes combine to make hours, and hours add up to days, and days to years…by then Death was already knocking on your door. No more witchery, she had promised herself a year ago. Whatever time she had left, it would be her own. She had let the village know she wouldn’t be able to do healing for them any more, and that was the end of it. Let them hate her for it if they wished. It would be a poor answer to her years of service if they did, but she wouldn’t be surprised. Human nature was remarkably ungrateful when it came to expecting sacrifice of others. And already it had begun. She had heard the whispers. Every child that died of the pox now died because of her inaction. Every injury that led to death now was due to her callousness. Never mind that illness and injury were a natural part of life, which only costly miracles could defy. Never mind that for two decades she had expended her own life-energy to provide those miracles. Never mind that Death was breathing down her neck now because of those very acts. This year she had turned them all away, and that was all that anyone seemed to care about. She leaned forward over the fire, trying not to ask herself the question that all the witching folk did, in the end. Was it worth it? Too much danger in that internal dialogue. Answer no, and your last days would be filled with regret. Answer yes, and then your dying was your own damned fault. Suddenly a knock on the door drew her from her reverie. Who on earth was visiting her in these final days, when all the town was treating her like a pariah? She walked to the heavy oaken door and pulled it open. By the dying light of the winter day she could see two figures standing outside. No need to ask what they’d come for. One of the figures held a small bundle in her arms, and from its size and drape she guessed it to be a child, swathed in blankets. A pang of emotion stabbed her in the heart, guilt and anger hotly combined. Isn’t it enough that I refuse you in the marketplace, in the temple, in the very streets? Must you bring your sick ones to my very door, to be turned away? For a moment she almost shut the door in their faces, but a lifetime’s habit of hospitality proved too strong to overcome. Grunting, she stepped aside for the two to come in. By the stove’s dim light she could see them better: a tall, gaunt woman, peasant-born, who had clearly seen better days, and a young girl by her side, hardly better. The kind you healed and sent home knowing that Death might claim them the next year anyway, from starvation or abuse or any one of the thousand things no witching power could heal. The girl had a hard edge about her, as if she had already seen the rotting underbelly of the world and become innured to its stink; it was a frightening look, in one so young. The woman….looked merely desperate. She expected the woman to argue with her and she was braced for it. Gods knew she’d been through this before, a hundred times over, it seemed. But instead the woman said nothing, merely lowered a corner of the blanket wrapped around her child. The glimmering green pustules on his fevered face spoke volumes in that moment, before she covered them up again. Green Plague. Imnea had seen it only once, years ago. That was after it had claimed half a town. The witching folk had banded together then — an event as rare as the Red Moon which had shone down upon the effort — trying to burn away the infection not only from a handful of bodies, but from the village itself. It was said there were times in the old days when the green plague, sweeping through the land, had killed two out of every three people. This time it didn’t. Maybe their efforts had helped stop it. Maybe the gods had seen so many witching folk offering up years of their own lives to heal others that they decided it was time for a single act of divine mercy to be granted. Or maybe Death was just too busy gathering up all the new contracts the witching folk had offered him that night to worry about spreading the convulsive disease further. She didn’t need to feel the boy’s skin to know he had fever. Or to read his future to know the terrible suffering that awaited him, if the disease went unchecked. It was a horrible way to die. “I don’t do healing any more.” The words lacked the conviction she wanted them to have. Damn them, why did they have to bring the boy here, into her home? “And I don’t any more. I’m sorry. That’s the way it is.” Each word scored her throat like a hot knife as she forced it out. Didn’t the woman understand what such a healing would cost her? What gives you the right to demand my life? The Plague would force the boy into seizures soon, terrible seizures in which he would scream out for water, but vomit up anything that was given to him. It would go on for days, if his family didn’t put him out of his misery. And they wouldn’t. They’d pray and they’d make offerings and they’d ask the gods to please, please make this boy one of the few who were strong enough to survive the Plague. And so he would suffer, endless days of agony, until all that was left was a desiccated husk from which the human soul had long since departed, begging unheard for the final mercy to be granted it. And then others would follow. The whole town, sooner or later. Maybe even Gansung itself, if the infection spread far enough. Very little could check the Green Plague once it had taken hold in a place. He was still in the early stages. If she healed him now, if there were no others infected yet, the town might be spared. Imnea turned away to stoke the fire. The new log wasn’t catching. The embers were growing dim. No bribes. No threats. No promises. Imnea was prepared to counter all those. But the simple heartfelt plea was none of those things, and all of them combined. Guilt stabbed like a not blade into her heart. I should give her a knife and tell her to end it. For the child’s sake. If she doesn’t handle the body fluids when she kills him there’s a chance it won’t spread. With a sigh she turned back to face the pair. They deserved that much, these villagers, that at least she would meet their eyes while she shattered their hopes. But it was the girl’s eyes that caught her own this time, not the woman’s. Clear eyes, remarkably so given the hollows of hunger and hardship that hung beneath them like dark moons. Green eyes, flecked with gold as if with fairy dust. Yet it wasn’t color or clarity that made the girl’s gaze so arresting, as much as an indefinable something… as much out of place in these dim surroundings as a gleaming star would be. Such depth, in that gaze. Remarkable in one so young. Imnea wondered briefly if she had the Power…but only briefly. She had no time to worry about matters of Power, least of all to appraise the potential of some fledgling witch who would probably die of hunger and cold in the gutters of Gansung long before she ever found a suitable teacher. Perhaps it was that thought which plucked at her heart like a harp-string. Perhaps it was the memories of the ones she had taught, and the children she had borne, and all those people who had turned to her for healing or counsel or simply comfort, in her thirty-five years of life. Maybe it was something about the Power that made her hear their voices now, begging her to help this woman…or maybe it was Death playing tricks on her. Trying to hurry her along, so that he wouldn’t be late for his appointment with the next witch on his list. Damn you to hell, she thought. My life you can have, that was mine to give up, but not this boy’s. Not yet. In a voice as harsh as winter ice she said, “Give him to me”. The bundle was given to her wordlessly. It was lighter than it should be, she noted; mostly blankets. The child hadn’t been big to start with, and the early stages of the Plague had probably stripped his bones of what little meat they’d had. Her own bones ached as she shifted his weight in her arms. Poor child, poor child, at least if you live through this you can tend to any others who get sick. there’s comfort in that. For a moment she shut her eyes. Just resting, gathering her spirit, letting the aches and pains of her premature aging settle into the background, so that her rational mind was foremost. The gods hadn‘t taken that away from her yet. I wouldn’t want to live through another Plague year anyway, she told herself. One horror like that is enough for anyone. She began to hum softly, a focus for her witchery. She could sense the woman and the girl watching, fascinated, as she prepared herself. If only she could show them what it felt like! If only she could share with another person — any person — the pain and joy and fear and exultation of such an act! For one of them to understand what the Power was like, how terribly it cost her to use it…that would be worth everything. Because then her sacrifice would be understood. Then she would be loved for what she had given up, not hated for all the times she had failed. At last, when the music was ready, when the room was ready — when the child and the mother and the time and the night outside and all the world were ready — she reached inside her soul to where the heart of all power lay. It was faint these days, so very faint, not the resplendent beacon of power she had discovered in her youth, but a much older soul, nearly exhausted now. It wouldn’t have lasted another year, she told herself. And it would have been a cold and lonely year to live through, with all the villagers hating her. Are you sure? Death whispered in her ear. Very sure, Imnea? This time there is no turning back. “Go to hell”, she whispered to him. The warmth of her living soul filled her flesh, driving out the chill of the winter night. Then outward it flowed, into the boy. Clean, pure, a gift of healing. She shut her eyes, trusting to other senses to observe as it bolstered his own failing spirit, feeding strength into his athra, giving it focus. Fire burned along his veins and the boy cried out, but neither the mother nor the girl flinched. The disease was strong in his flesh, rooted in a thousand places; she burned them all, drawing upon her athra for fuel and the boy’s own soul for focus. Some witches said that a disease was like a living thing, that fought back when you tried to kill it; she thought of it more as a thousand living things, or tens of thousands, that might fight or hide or burrow deep into the flesh for protection from such an assault. You had to find them all or the disease would come back later with renewed strength. How much of her life-force had she wasted in her early years, learning that lesson? The log in the stove hadn’t caught; the fire was dying. Winter’s chill seeped into the cabin and into her bones, and she let it. There wasn’t enough Power left within her to keep her flesh warm and heal the boy as well. Not that any witch with a brain would waste Power on the former task anyway…not when there was wood to be burned. The Power was too precious to waste on simple things. If only she’d understood that, in the youth of her witchery! A tear coursed down her cheek as she remembered the hundred and one little magics she could have done without, the tricks performed for pleasure or show or physical comfort…if she could undo them all now, how much time would they add up to? Would they buy her another week, another year of life? Too late now, Death whispered. Dying. She was dying. This is what it felt like, when the embers of the soul expired at last. She could feel the last tiny sparks of her athra flickering weakly inside her. So little power left. How much time? Merely minutes, or did she have all of an hour left to wonder if she had done the right thing? “It is done,” she said quietly. She tried to rise, to see them out. Hospitality. But her legs had no strength, and her heart…her heart labored in her chest with an odd, unsteady beat, as if the drummer which had guided it for thirty-five years had stopped his music and left it to flounder. She was cold. So cold. The eyes of the girl were fixed upon her. So deep, so hungry…so very determined. Drinking in knowledge as if it was the fuel her soul required.. See, child, what the Power can do. See what happens to you when you use it. There was no wonder in the child’s eyes, or even fear…only hunger. Heed this lesson well, my child. Remember it, when the Power beckons. Remember the price. “Come, child.” It was the mother’s voice, nearly inaudible. Imnea’s hearing was growing dim; the world was an insubstantial thing, all murmurings, windsong and shadow. Are you ready? Death whispered to her. Imnea clung to life for a moment more. A single moment, to savor those dreams which had guided her… and to mourn those which had gone unfulfilled. Then: Yes, she whispered. Voice without sound. Yes, I am ready. In the stove the last embers of the fire sputtered and died, leaving the room in darkness.